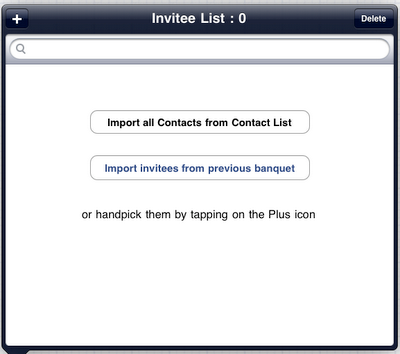 You can add "contacts" myBanquet . Just go to the Contacts Tab and tap on the plus icon. Once you are done with the List -and you can come back and change at any time-, go to your Banquet and tap on the 'Invitee List' button. Tap the 'Import all Contacts from Contact List'. 1. If you only need a simple list with the guests names then just create a file with the last name, middle name and first name in that order separated by commas. Go to step 3. 2. If you need a more detailed list, you can download the template from this link: Click here to download the Contact List Template. 3. Fill up your invitee list, it doesn't matter if you don't have it finished. You can repeat this process many times. 4. Export the file as a CSV file. Note: No need to rename the extension to 'bpil', the version 1.72 supports 'csv' extensions. 5. E-mail the file to an account that is available in your iPad. 7. After you tapped the window, myBanquet will run and window will show the guest list from the CSV file. 8. If you included the header, leave the indicator in ON, otherwise switch it to OFF. 9. To determine if there is duplicated information, the application will match the record by first and last name. If it finds a matching, it will display an UPDATE icon instead of an ADD icon. The application will only override the database if the information coming from the CSV is more complete. 10. You can skip importing a record by tapping the ADD or UPDATE button. 11. Once done, just tap the Import button. Go to the Contact list and you will see your data. (*) Upiksoft does not alter or publish any of your information, it will be stored only in your iPad and you can remove it at any time. Moreover, myBanquet only reads and stores the first, middle and last name of your contacts. From this window you can update, add or delete any contact. If you delete a contact person from this list, it will be removed from every banquet he has been invited to. Tap on any contact and a detail window will appear, in this window, you can manually add or modify the information.